The start of the new city. Linda(my wife) and I got married in 1966 and had to find a town where we could afford a three bedroom house with easy access to London where I worked. Another consideration was easy access to a school, as we had two daughters aged 6 and 8. We chose Bletchley and bought a house on the Poets Estate, which had easy access to the station, and the Holme Chase school was nearby. The rail line to Euston was recently electrified, so it was more convienient for me to comute to my work in London, we found a house we could afford on Holme Chase that also was close to a school. My wife was a secretary in London but found the salaries in Bletchley were half what she had been earning in London. She worked for The Meat and Livestock Commission, and then Legal and General at Stephenson House (now converted into apartments). She had the worst end of the straw, newly married, in her early twenties working, looking after our two daughters aged 6 and 8. We had to adapt to a new way of life, both being Londoners, moving to the sticks. At that time we found quite a few other people in the same situation especially a group from Kembles the piano manufacturers, they had relocated from London and we met in the “Con Club”. 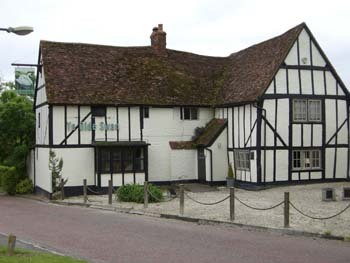 One of the places we enjoyed visiting with our new friends was a pub at Woughton on the Green called The Swan. In those days it was a journey through country lanes to get there. 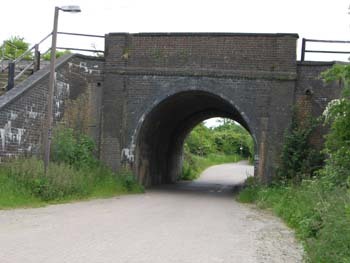 The journey started by going under the railway arch off Watling Street outside Bletchley. A couple of memories which remain, one was playing bar Skittles.This was new to us, it was a table with a net around the back and forming an open tent with skittles on the table, the idea was to knock them down by throwing a wooden “cheese” at them. Health and Safety did not come into it because if you hit the front edge of the table the cheese came flying back into bar.The barman served the beer from barrel at back of the bar, and once he got to know you, he let you help yourself and put your money into a tin at the back of the bar, this was never done in London. Hi,Seeing the picture of the railway arch brought back some old memories.From 1957 to mid 1960 I delivered newspapers on Sunday mornings all around Simpson village.I used to pass through this arch on my way back to the Watling St.on my way home.Many times it would be pouring rain and so I would stop for cover under it.I sometimes found myself sharing the road toward the arch with a flock of sheep that a farmer was moving between fields.I used to pull a wooden box on old pram wheels behind my bicycle .Having delivered all of the newspapers at this point my cart would be empty—-the farmer would always yell at me..Watch out boy them sheep will be jumping in your cart— I never quite knew if he was serious or not. One time a runaway horse passed me up just past the arch and continued on on along the Watling St.. I used to earn seven shillings and sixpence for my paper round which took about 5 hours to complete and by the time I got back home it must have been about a ten mile trip.Apart from the sometimes wet or freezing cold conditions I sometimes had to deal with I did actually enjoy doing it.I had to collect the money a most stops and keep track of it in a small book.Most houses got 2 papers that cost tuppence or three pence each and a penny a paper was charged for delivery.I had to carry a leather pouch over my shoulder ,kind of like a bus conductor.This would get quite weighted down with pennies and half-pennies etc. I had a weekly deal with an old IItalian man who would give me a free wafer from his small cart and he would give me paper money for all my excess change.As I was collecting such small amounts of money I almost never got tips but people often gave me some sweets or chocolate .One lady would bring me sticks of rock back when she went on holiday.I also often got a piece of fruit and in season I was not above scrumping a few overhanging apples.Christmas was great as almost everyone gave me two shillings or a half a crown and that added up to quite a lot.I remember feeling very rich on those three Christmases of 57,58& 59. I delivered to large fancy houses ,one owned by a brigadier ,a shop,a pub, the vicarage,an infants school, modern new bungalows and very old cottages.Several were grand old thatched cottages with picket fences and lovely rose gardens.There were several farms too where I loved to vault over the 5 barred gates. There were even some factories too along the Watling St.I was 16 and working full time as a butcher boy when I finally stopped doing the route.I kind of wanted to have that one day to lay-in bed for a change. I had by then biked around Simpson about 125 times that was a lot of Sunday mornings.My bosses son was old enough by then to take over. On my last day my boss Mr. Durant told me that his wife kept track of the books for his route and mine and I was much more accurate than him—never being as much as a penny out—-I was quite proud of that.